One morning I merrily descended the steps to go for breakfast followed by NaRuk, but she suddenly stopped... 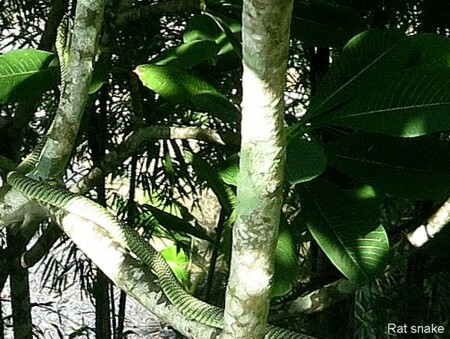 I had been oblivious of a snake about to cross the path betweem me and her! Harmless I think as long as we don't corner it... I pulled out the camera, but before I could get the proper shot the lens fogged up as airconditioning met Phuket humidity. 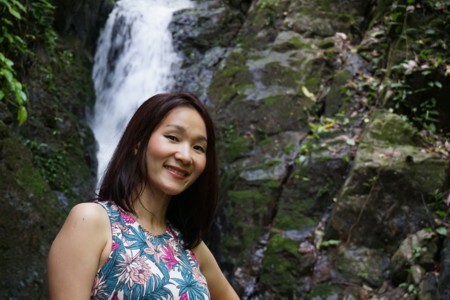 The holiday mood stopped Monday morning after I awoke at 04:00, and was out the door at 05:00 to take NaRuk to the airport along the twisty tight uphill downhill road to the airport for her 06:25 Nok Air flight back to Bangkok. 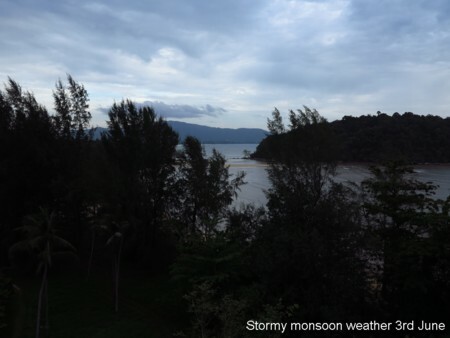 The Monsoon storms abated and the weather was fine the morning after I picked NaRuk up from the airport after her late night arrival. I have not been on a beach holiday since 1966 when I recall being on the Normandy beaches, catching sunburn. I remember peeling the burnt skin flakes off my back... I've been much more careful with the Sun ever since... 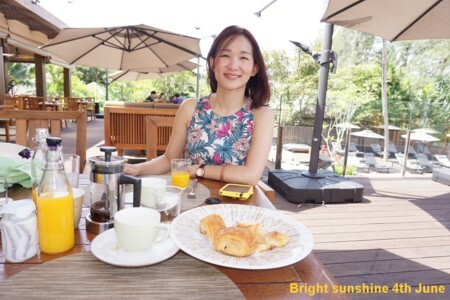 Though it's sticky, 'delays my departure, I do use sun lotion, and tend to keep out of direct sunlight. 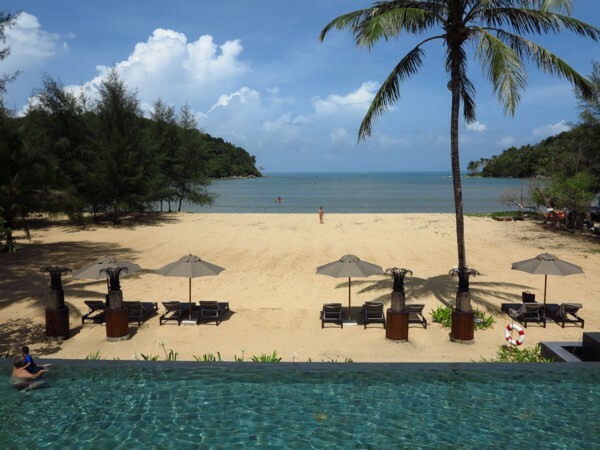 But here I am in a bit of paradise known as the Anantara Layan Phuket Resort, and I began to relax, I went swimming, and I went out on a kayak. The RV9A doesn't have a good short field performance and the uncut grass will slow the small spatted wheels on this cruising machine, and so this will be a solo departure for me. 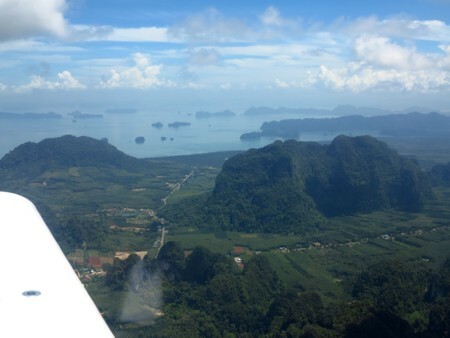 We had deliberately done a long scenic flight to Phuket to use up some fuel to have a reduced takeoff weight. 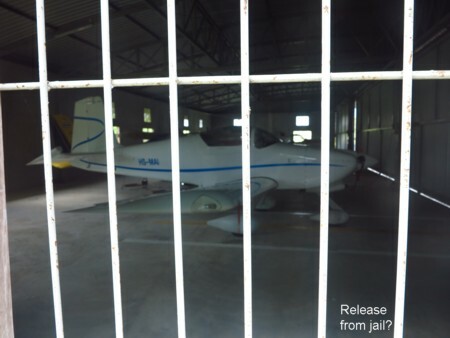 This will be the first test for this aeroplane off a 500 metre grass strip. 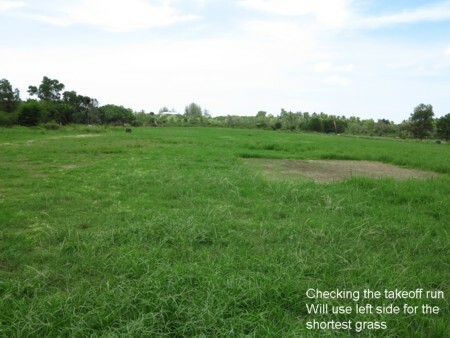 The RV9A used 2/3rds of the runway. I see 2,290 RPM from the IO-320 engine on takeoff, but small wheels are a drag! 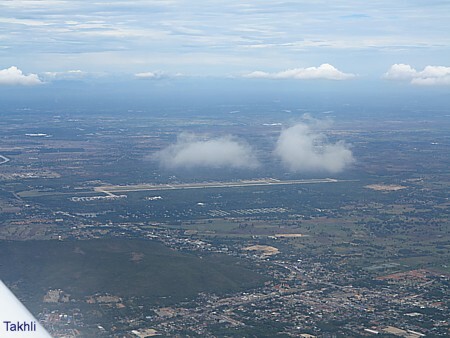 Airborne at 11:23 I attempted to talk to Phuket but there was no reply, I switched the squelch off, still no good, and so I managed to relay messages through a Thai Smile Airbus on approach to the airport. 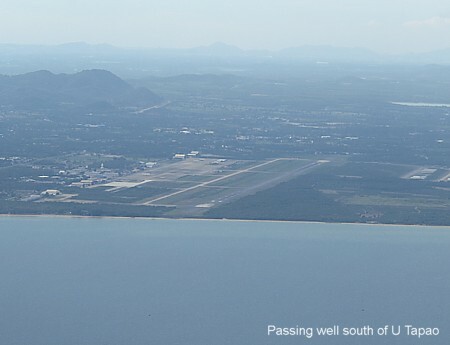 Since the departure path is away from Phuket Airport there's no reason why 2,000 feet or 3,000 feet should not be approved to enable communication. 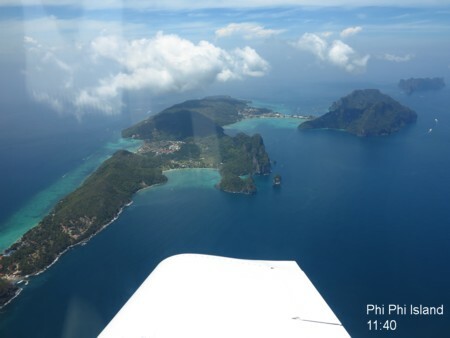 I was nearly at Phi Phi Island, a long way out to sea at 1,000 feet before I managed by relay to get approval to climb to 3,000 feet. 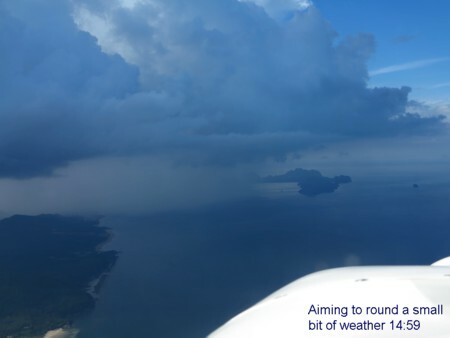 The 140 degree radial puts a lot of mountain between an aircraft at 1,000 feet and Phuket ATC. 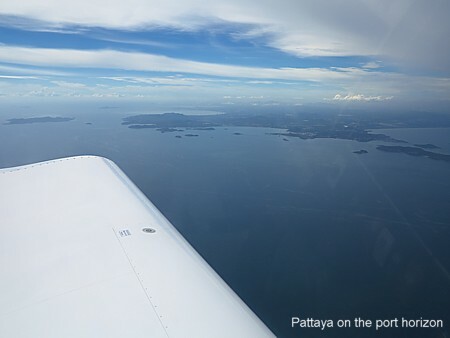 Once on course it was an easy flight to Surat Thani at 3,000 feet in good visibility. I joined downwind and slowed to ensure that there was plenty of space between me and the Air Asia Airbus 320 on final approach. Landing was at 12:19 after 56 minutes in the air, 16 minutes more than my original estimate before the Phi Phi diversion. Light aircraft are always second to airliners, and so I waited for the Ch.com A320 to taxy out before I started the engine. 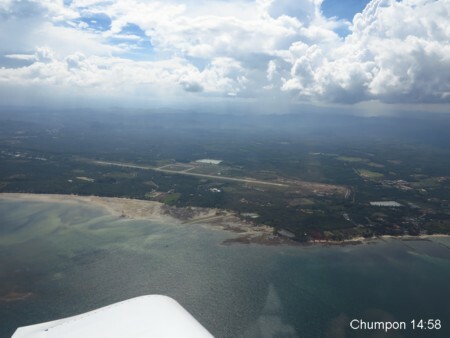 Takeoff was at 14:10 and I headed up the coast towards Chumpon. 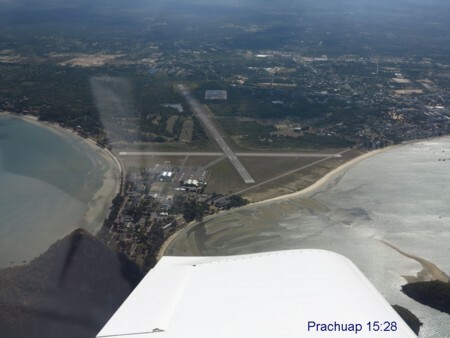 ATC routed me south of the airport, all the way to Rayong before circling me back to land on runway 18 at 16:18 after 2 hours and 8 minutes in flight..
At U Tapao we added 50 litres of fuel which filled the left tank, and put the right tank at 3/4. I could have opened and paid for another fifty litre tin, but that would be a waste of 30 litres of fuel. My night stop was at Alasdair and Gill's in Jomtien; cocktail by the swimming pool followed by home cooked dinner. The porridge was runny this morning and so I thickened it with muesli, followed it up with yoghourt, croissants and honey, and washed it down with tea. I've put on two kilograms on this trip. I fed the Ford Ranger pick up truck with a fill of diesel fuel and delivered it to Phuket Air Park for 10:00 am. 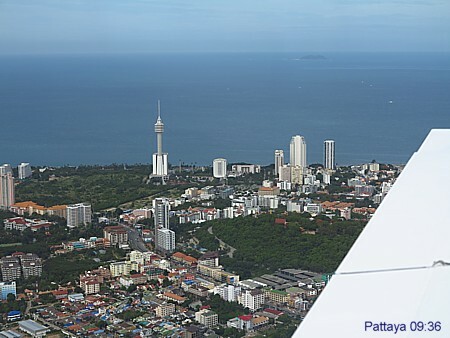 I filed a flight plan to Surat Thani, and I phoned Phuket Tower to obtain departure clearance. 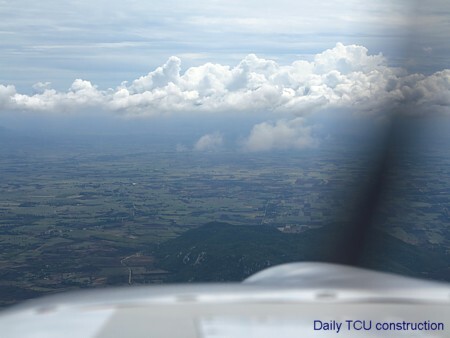 They are super cautious here, and told me to depart on the 140 degree radial, not above 1,000 feet. This is more than a little worrying for a single engined aircraft, and there's no reason why ATC can not authorise a safe altitude. The 140 degree radial put me a long way off track. 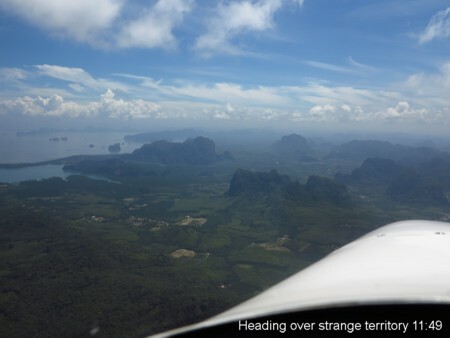 Phi Phi required a northbound track through Krabi airspace before turning on track for Surat Thani. I'd do things somewhat differently if I was told to stay on the 140 degree radial at 1,000 feet until contact was made in the future. I would agree a distance limit before I make a turn. Onward fuel supply was a problem. Bang Phra is closed on Mondays, I could not get any information from Best Ocean as to whether they had any fuel, Hua Hin requires three days notice to get permission to fly in, and I needed to give Bangkok Don Muang 24 hours notice, that left U Tapao as a good choice for a petrol stop. 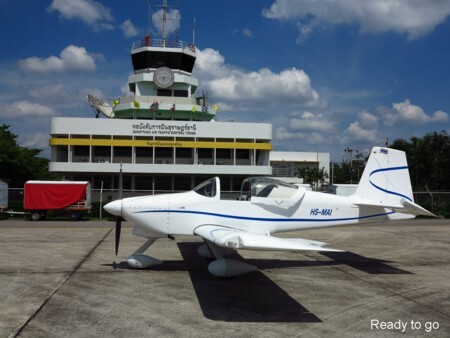 At Surat Thani I paid the 85 Baht landing fee, ate a 120 Baht kao pad gai, and filed a flight plan. 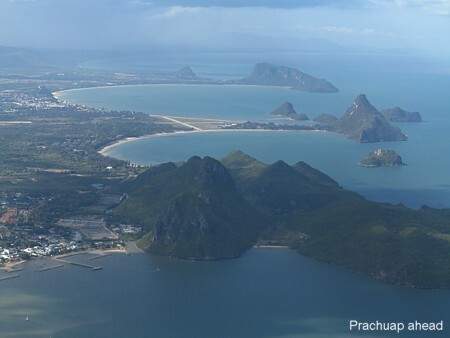 After Prachuap I requested 7,500 feet on course for U Tapao for the long crossing of the Gulf of Thailand. Alasdair decided to join me for this flight north to Chiang Mai, and I was happy to have his company. I paid the landing and parking fees, 43 Baht and 325 Baht respectively, and paid for MJet's handling fee (somewhat more). I kept an eye on the fuel consumption. There was just over 30 USG in the tanks, but I worked on 28 USG usable. Half this (14 USG) was used at 11:24 with just over an hour left to go at 13 Nm southwest of Phitsanulok. 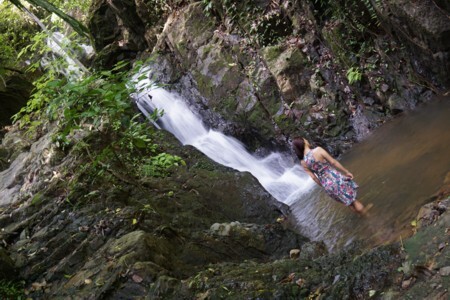 I wear a pilot shirt for my journeys in Thailand, they do not appreciate sloppy dress. 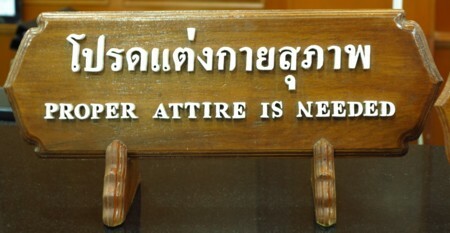 If you want access to your aeroplane, dress like crew. I went into the Thai Navy flight operations office and filed a flight plan. 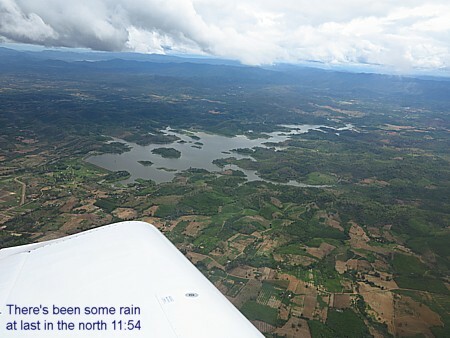 I filed to Nok with Phitsanulok as an alternate in case I needed fuel enroute... 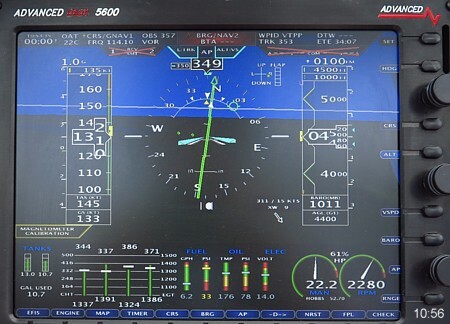 It takes a while and experience with the particular aeroplane for me to rely on the fuel flow reading, and quantity gauges. 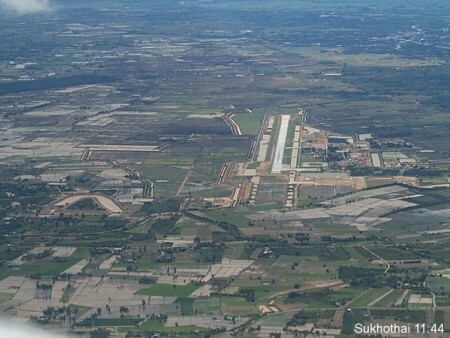 Takeoff was at 09:24 from 18 at U Tapao with a right turn to follow the coast to Bang Pakong which is the first point on the VFR route northbound east of Bangkok Suvarnabhumi Airport. 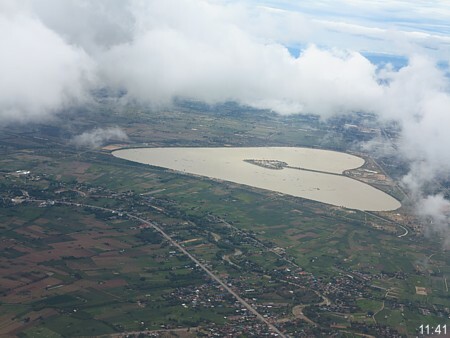 We entered at 1,500 feet and flew at this height to Bang Nam Preaw, then Ban Look Sua, and on to leave the airspace at Hin Kong. 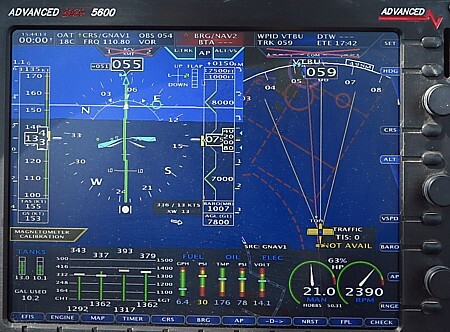 Bangkok ATC handed us over to Oscar military who ruined my flight planning by steering us 310 degrees for a while. I asked for 4,500 feet enroute and this was approved. Oscar told me to call Takhli but there was no reply (I've had this trouble before) so I went back to Oscar while Takhli's frequency was active on the other radio, listening to both. Another aircraft made contact with Takhli and the controller replied, so I called again and made contact. We were turned on to 310 degrees again... So much for my planning, and fuel concerns. Select VTCY and press DCT. 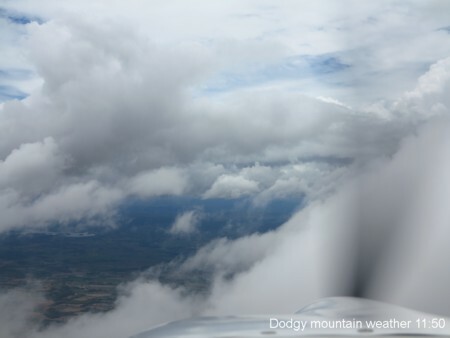 The clouds built up as we approached the mountains in the north, but there were plenty of gaps and it was an easy flight over the high ground while comparing the yellow and red terrain warnings with the topography outside. I dipped the fuel tanks, L = 30% R= 25% (18/18 when full).